The interior of the restaurant was so unique and we loved everything about it! Our first dinner in San Juan was at Mesa Verde (Green Table) Restaurant on Calle de Tetuan Street. 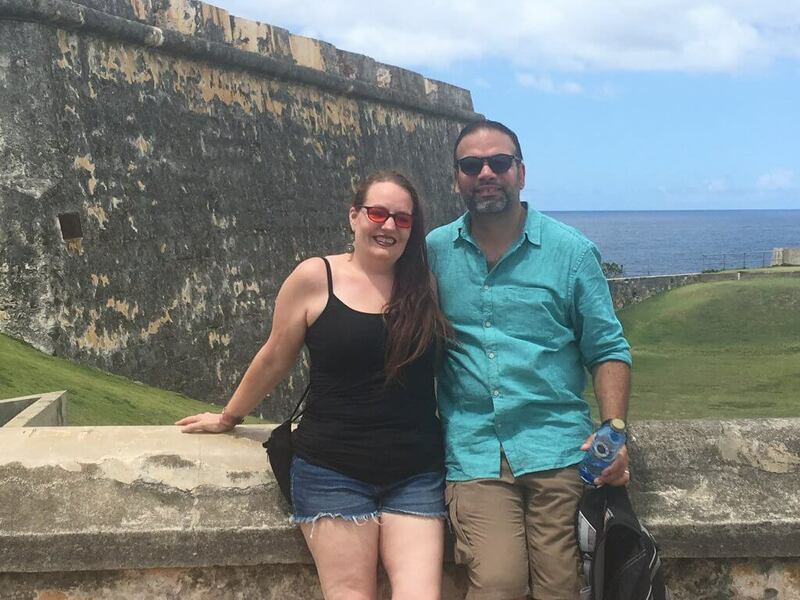 We were in Puerto Rico to celebrate our 21st wedding anniversary and were looking for someplace special to dine. Although the night we ate at Mesa Verde wasn't our actual anniversary dinner, we couldn't ask for a more special place. Conner, our waiter, greeted us with such warmth, we believed him truly was glad to see us! Before we sat down, we asked if they were familiar with Celiac and gluten allergies and whether or not they could accommodate my wife’s dietary needs. Needing to eat at gluten-free celiac friendly restaurants, we knew we'd come to the right place. 98% of Mesa Verde’s offerings are gluten-free. They source from local vendors for fresh food. He advised us of the one or two things on the menu to stay away from and knew exactly which parts of the dishes contained gluten. We sat down to eat confidently we were in good hands! The interior of the restaurant was an elegant blending of old world class mixed with a newer more urban flair. The tin ceiling panels were weathered with a beautiful antique look to them. The pendant lights were made of mason jars, and they had exterior patio lights intertwined between them. The chairs were mismatched and had an antiquated look to them which gave the feel of being in an old-fashioned sitting parlor. The tables were re-purposed from antique sewing tables complete with pedals which still turned the gears. A large white china breakfront with various pottery and books was against the far wall. The ambiance of this place just took you back in time to a simpler era. As a perfect finishing touch, the female wait staff were both wearing tutus and leotards which tied the whole experience together! The food was incredible. While not traditional Puerto Rican cuisine, this place gets outstanding in food quality and taste! Conner explained each dish on the menu and was happy to answer any questions we had. Our waiter was amazing, to say the least. He described each dish so fervently that he actually got me excited to eat broccoli as an appetizer! For the main course, my wife ordered the Morracan Lamb Stew (a dish she’d never had before) and which did not disappoint in the slightest! It was delicately seasoned and tasted amazing. My husband had a crispy duck in a savory almond sauce, something he couldn't get enough of. For dessert, we enjoyed an incredible coconut custard, minus the almond foam, which contained wheat flour. My wife was happy as there are usually not many gluten-free desserts she can eat at restaurants. The portions were generous, and is all locally sourced whole foods, left us satisfied without feeling heavy. To sum it up, this was a fantastic experience, and we enjoyed ourselves immensely. This was our favorite place to eat during our three day trip to Puerto Rico and we intend to return when we are back on the island. The meal was slightly upward in price, but believe me when I tell you it was worth every cent.